I don't really make New Years resolutions, like lose weight, give up chocolate, (cuz that would be broken instantly!) but I do try to make new goals for myself each year. For this year, I want to blog more. I've kind of gotten into a slump lately, so I want to regain the passion I had for blogging in the first place. 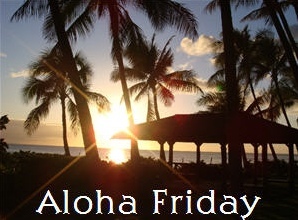 Head to Island Life for more Aloha Friday questions. Not really, however this year I did find something to work toward that would help in the whole life aspect. Yes and I almost never stick to them, LOL! Not a fan of resolutions because they are too easy to break. I prefer to set goals. This year my main goal is to take things one day at a time and try not to get too far ahead of myself with worry. Just one. To work on making myself better at living this life. No because I know I won't stick to them. No resolutions for me. I know my limitations and one of them is not fulfilling resolutions! LOL! Don't Write a New Blog Post, Link Up an Old One.